On August 27 on Jeju Island, South Korea, experts and concerned persons from each of the municipalities joined hands at the GGIS forum. Director Hiroshi Ohama of the prefectural government’s Environment Department is sixth from the left. 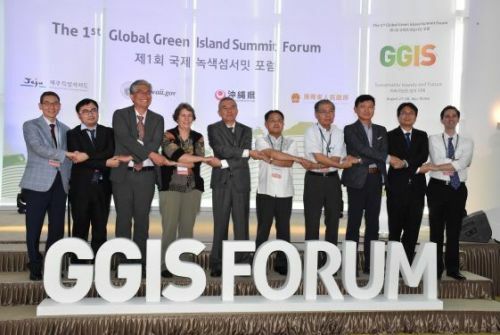 On August 27 the governors of Okinawa, Jeju Special Self-Governing Province in South Korea, and Hawaii met together on Jeju Island for the first Global Green Island Summit (GGIS) forum to discuss island regional environmental issues. About 100 people attended, including residents of these three islands and residents of islands in the South China Sea as well. These islands have many features in common among aspects such as their natural environments, topography, and industries. Persons concerned with these issues came together to discuss various points of view on the importance of the coexistence of the environment and tourism, and environmental protection. On the first day personnel and experts from each municipality made presentations on dealing with reports and the environment in cases of abnormal weather such as droughts, hurricanes, and typhoons. Professor Junichiro Tsutsumi of the University of the Ryukyus reported on policies to accomodate climate change, and Professor Emeritus Tomio Kuroda of the University of the Ryukyus reported on the Fukuzato underground dam project on Miyakojima. Director Hiroshi Ohama of the prefectural government’s Environment Department explained policies including countermeasures to garbage washing onshore from overseas. Hawaii is striving to implement a low-carbon society, with the goal of switching four islands to renewable energy by 2045. Chief of Staff Melissa Miyashiro of the Blue Planet Foundation, an environmental protection group from Hawaii, said that they are expecting tourism to increase, and use of aircraft to increase as well. She also mentioned the importance of raising efficiency. Jeju Island’s officials have declared the intent to reduce the island’s carbon emissions to essentially zero by 2030. An Asia climate change education center’s representative gave information on using wind and solar power for electricity, and reported on efforts toward the goal of making a 100 percent electric automobile. The last day of the Summit was August 28, at which time representatives of the three municipalities signed a joint declaration concerning environmental protection that they had compiled.